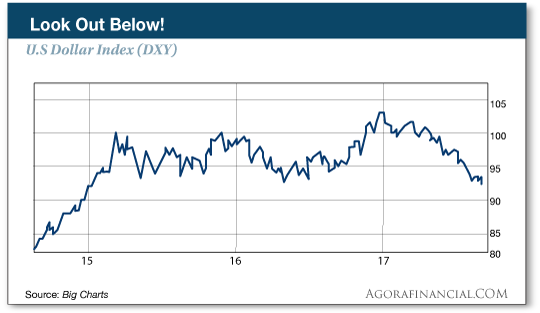 Your 401(k) at risk in Washington… good news on the World War III front… your crypto questions answered… and more! 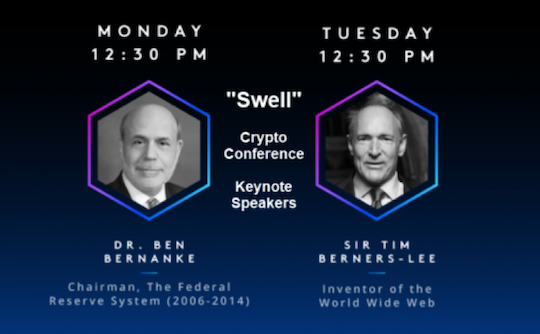 What, pray tell, does former Federal Reserve Chairman Ben Bernanke know about cryptocurrencies? Whatever Bernanke says in Toronto, he’ll be paid handsomely for it. A few months after leaving the Fed in early 2014, The New York Times pointed out he collects $200,000–400,000 per speech. Clearly the people behind Ripple have played their cards well if they can stump up for a fee like that. Point being, the closer you are to the creation of a cryptocurrency, the more lucrative the profits. And today? As we check our screens, bitcoin trades for $4,319. That means the $30 grubstake in 2010 is now worth $42 million. You’ve heard more than enough hype from us about it by now. What makes this one ICO so special? “It’s the first cryptocurrency whose value is based on time rather than on the conventional ‘mining’ solution of mathematical problems,” says Lou. Later today, Lou is sending detailed buying guidelines to readers of his premium advisory The Crypto Alert. For maximum gains, you’ll want to act before midnight tonight. Any later, and Lou says you might regret it the rest of your days. Here’s the link. Another week, another attempt by gold to bust through the $1,300 barrier. Today just might be the day: As we check our screens, the bid is up to $1,302. That’s as strong as gold has been since Election Night last year, when traders were on pins and needles awaiting the results from Michigan and Wisconsin. Stocks, you wonder? As a group, there’s not much to say. The Dow is down a bit, the S&P 500 up a bit. The major indexes remain less than 3% below their all-time highs reached earlier this month. Oil refining stocks are among the day’s winners. Hurricane Harvey has not only drenched metro Houston, but it’s taken about 15% of U.S. refinery capacity out of commission. At last check, gasoline futures are up about 3% today. But crude oil is down 2.4%, a barrel of West Texas Intermediate fetching $46.74. The big economic number of the day is the trade deficit. It widened more than expected last month to $65.1 billion. That won’t help the third-quarter GDP figures. Later this week we’ll get the “income and spend” report that includes the core PCE, the Fed’s favorite measure of inflation. And the August job numbers come out on Friday. Here we go again: American “homeowners” are piling back into home equity lines of credit and cash-out mortgage refinances. HELOC originations jumped 8% during the second quarter, to the highest level since 2008, according to Equifax. Cash-out refis are up 6% year over year, says Freddie Mac. On the other hand, banking insiders don’t seem exactly confident about the future. “Executives and board members at the top six U.S. banks have been consistent sellers of their own banks’ shares this year,” says the Financial Times after pulling apart disclosures tracked by Bloomberg. That’s not unusual by itself… but the months-long duration of the selling is. The salmon-colored rag chalks it up to anxiety over the Trump economic agenda passing Congress: “Bank stocks have become ‘a barometer’ for the success or failure of the Trump administration’s policies,” said Robert Smalley, credit analyst at UBS in New York. Hmmm… The KBW Bank Index is up less than 3% year to date, compared with 8% for the S&P 500. Can’t say we didn’t warn you: For nine months we’ve been saying tax cuts and infrastructure spending are likely to run aground on the shoals of a debt-ceiling donnybrook… which is coming in September. That is, your pretax 401(k) contributions would be turned into after-tax contributions like a Roth-style plan. Washington number crunchers figure it would add up to $584 billion in additional revenue by 2020. We warned you about this four months ago: It’s a hobbyhorse for Trump’s chief economic adviser, “Goldman” Gary Cohn. And Cohn emerged victorious this month from a power struggle with the now-departed White House aide Steve Bannon. Maybe we can breathe easier: China and India are stepping back from the edge of war. In June, Indian troops ventured into disputed border territory — aiming to stop a Chinese road-building project. The standoff threatened to blow up into full-scale war as happened in 1962… only back then, neither China nor India possessed nuclear weapons. The situation was sufficiently volatile — and grossly undercovered by establishment media — that we’ve made a point of doing updates every couple of weeks. That said, the border is still disputed… and there’s no word about whether China will go ahead with the road project anyway. “You have to be kidding me!” begins today’s mailbag. “Last week in The 5, where Steve Mnuchin and his wife Louise Linton are bragging about the taxes that they have to pay, is bad enough. But when it came to their ‘self sacrifice’ for the country that was just plain over the top. “It feels like I’ve walked into a casino with no idea of the odds at any of the tables or machines. There are no earnings streams to back any of the prices, just Hopium-fueled speculation of ‘This could be really cool someday.’ I’m reminded of internet stocks in the late ’90s. “I bought a little bitcoin (at the absolute top), lost 10% in a few days but that wasn’t a problem because I was able to exchange it into a Chinese-backed crypto that lost another 15% in a day. The 5: Rest assured Lou has a five-step screening process to analyze all of the 900-plus (!) cryptocurrencies out there. If it doesn’t make the cut, he doesn’t recommend it. “I’m considering a subscription to The Crypto Alert,” writes our final correspondent, “but I have several concerns. “You use massive marketing hype to sell all of your services, but in this one your sales copy team found a new high (or low, depending on your perspective). I assume your $2.2 million investment in this (mentioned in your sales page) ICO was acquired for far less than any of us will pay for the ICO. This automatically makes me fear a ‘pump and dump.’ It would be reassuring if it were stated on your sales page that your company (or any subsidiaries, affiliates, etc.) will not sell any of the recommended ICO coins for a certain period of time. [Whoa, whoa, whoa. We have to interrupt the reader right here. The $2.2 million is how much our publishers have committed to salaries for conducting this research. Our editors are strictly forbidden from investing in the securities they recommend, and other employees can invest only after the recommendations are published. That’s one of several safeguards we take at Agora Financial to make sure we’re acting only on behalf of our readers. “There has been widespread speculation in online forums as to what the ICO is, by parsing your sales page (that mentions Aug. 28 as the ‘date’). Some speculate if that’s the day after the ICO ends (which perhaps means it ‘goes public’) or if that’s the day the ICO starts. “This raises possible problems: One possibility is if this ICO is for Corion (which ends Aug. 27) and if so, no U.S. citizen can participate (unless they lie, use a VPN, etc.). I’m not asking for which ICO it is, but to confirm that a U.S. citizen can participate. The 5: You’re not the first person to raise the U.S. citizen concern. The vast majority of our readers are U.S. citizens or residents; Lou’s recommendation is legal and accessible for U.S. readers. As indicated earlier, Lou will furnish details to subscribers of The Crypto Alert this afternoon on how to buy. New subscribers will get instructions on how to access these details as soon as they sign up. It’s in our interest to make the process as seamless as possible for you the reader. But again, the process can take place only if you make the first move. And it’s best to do so by midnight tonight. Here’s where to do so. P.S. It’s a “crypto-quake” in action: This morning Lou Basenese urged his Crypto Alert readers to take 200% profits on a position he recommended less than three weeks ago. But bigger and better is still to come — much bigger and better. Today. If you want in on the most lucrative “initial coin offering” ever — the “last best chance” to profit from the red-hot cryptocurrency market — the time to move is now. After midnight tonight will be too late. One final time, click here for access.